CMLL has an iPPV tomorrow on Cleeng. It’s a good show for four matches. 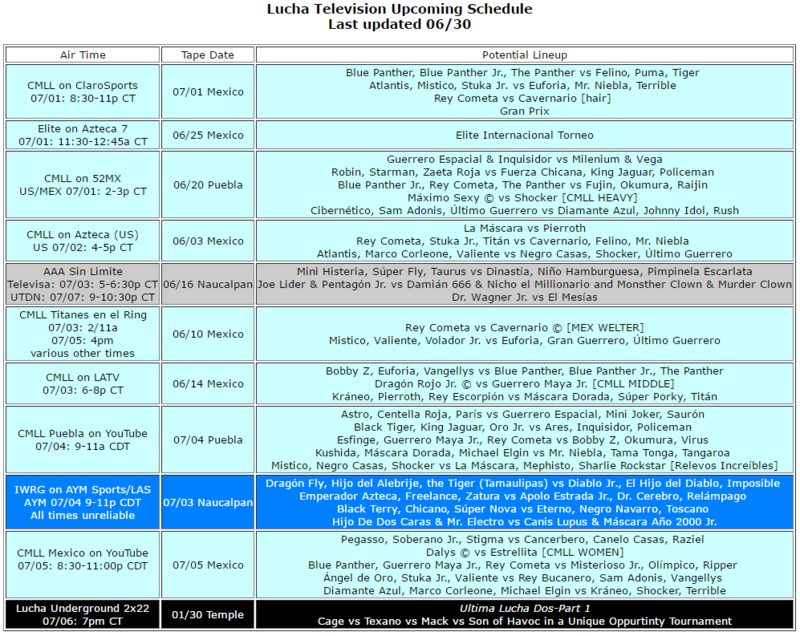 Elite, after the iPPV, will air the matches from Saturday’s section of the International tournament. AAA should be back to normal programming after airing the Lucha World Cup. (They’re actually sticking in the order.) This should be the first week of the Naucalpan taping. The Lucha Underground preview suggests the first week of Ultima Lucha Dos will focus on the Unique Opportunity tournament in for week 1. 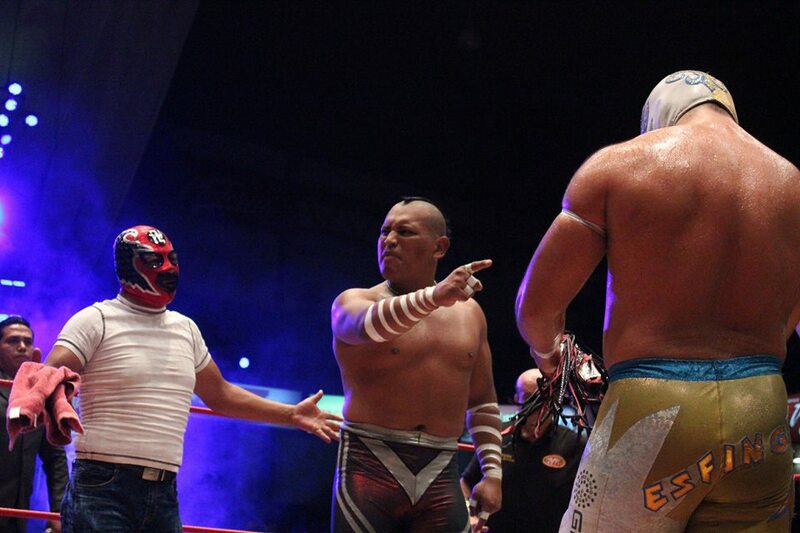 Esfinge took 2/3, the last with a Nudo Egipcio, to win Furia Roja’s mask. Furia Roja is Iván Alejandro Lemus Pérez, Guadalajara, 20 years old, 6 years a luchadors. There’s video of the mask match! (I haven’t watched the video of the match yet.) Main event sets up Volador/Tama next week, which sounds fun. Yesterday was press day for Rest of the World Team of the CMLL Gran Prix. They were also on Informa, where they were entertaining (sometimes unintentionally so), though there wasn’t any news. We’re now sure Atlantis is not on the CMLL team, that’s for certain. Michael Elgin was surprised to be so applauded by the fans already. Okumura & Sam Adonis also appeared on Azteca to hype the show. I feel like CMLL’s doing more press for this show than most any show they’ve done in the past. The other parts of the show included Nitro mentioning he’s heading back to Europe from July 2nd to the 19th, to train European wrestlers in lucha libre style. Sangre Azteca used to go on these tours with him, but has not the last few years. There’s no ELITE show tonight. They’re back next week. Ring of Honor announced Stuka Jr. will debut against Kamaitachi on July 16th. This is a TV taping and the match should air sometime in the four weeks after. This match was at one point planned to be Dragon Lee versus Kamaitachi, but Dragon Lee’s not expected to be ready to return at that point. Stuka wasn’t the first name that I would’ve gone with for the first CMLL rep in ROH, but he’s a reliable guy who always seems to be solid matches so he should do fine – the goal is probably more to give Kamaitachi a lucha opponent to look good against, and try out the CMLL/ROH alliance before committing to anything major. LigerFever has a transcript of Mascara Dorada’s interview with RudoVision. Dorada mentions NJPW had offered him a one year full time contract for some time, but Dorada only wanted to do tours so he could go home to his family. Dragon Lee posted an old photo with Cibernetico, which reminds me there’s been no mention of Cibernetico anywhere since Monday. Hope he’s good. RobViper has highlights of 06/08 & 06/15/2010 CMLL. TKD & Eric have reviews of last night’s Lucha Underground episode. There’s a video game conference going on in Guadalajara this week. Among the many presentations was one by Larva Game Studios, the company (under a previous name) which published the AAA video game six year ago. It was the first game they made, and there’s a still of their presentation about the mistakes they learned from in making the game. Violento Jack talks about his upcoming trip to Japan. Reversos has a story on the Arena Azteca Budokan/Morenos documentary. El Grafico talks about the rise of Volador. Debate interviews the host of the Metal Libre YouTube channel. Dragon Gate has a mystery man starting on Saturday. Flamita has spent the last couple months criss-crossing Mexico, working shows everywhere and often. There’s no matches announced with him going forward. I haven’t been told this is his Dragon Gate return, but Flamita did mention wanting to go back and the pieces fit.